Clockwork wound from the back, open the lid & the horse figurine revolves as music plays. 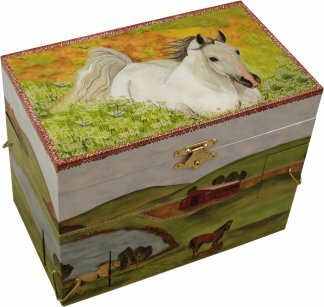 A beautiful pony design music box with four secret little drawers, one on each corner to hide trinkets & treasures. 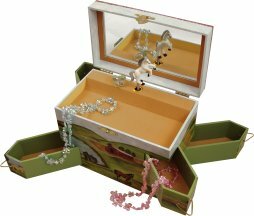 Open the music box to hear the music play and watch the white pony twirl to the music in the mirror.